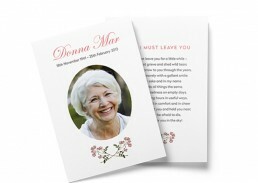 We offer a variety of designs for printed material for you to choose from. 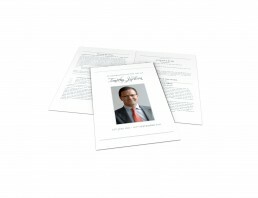 Your order of service booklet will depend upon the type of service and can range from very simple and concise to lengthy and detailed. 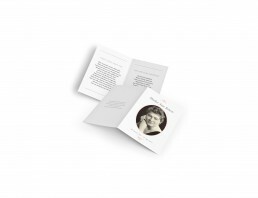 The booklet is A5 in size, printed on high-quality paper stock and can be 4, 8, 12 or 16 pages. 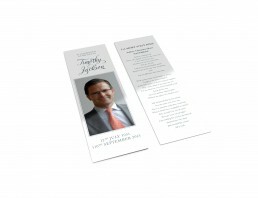 Bookmarks are a simple, timeless and elegant way to remember a loved one. 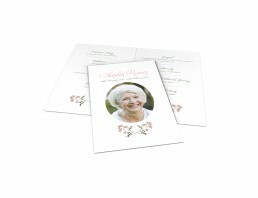 Thank-you cards are similar to holy cards and can include envelopes. They have a front and back cover, and two inside pages. You may choose to have a photo on the front with thank-you text on the inside. They can be given out at the funeral service or mailed afterwards. 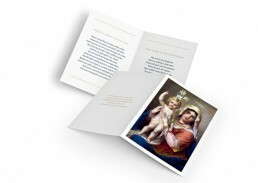 Holy cards are small “greeting” cards with front and back covers and two inside pages. Usually a religious image or icon will be on the front page with a photo and details of the person who has passed on the inside front cover. The other inside page may have a prayer or verse. These cards do not come with an envelope. These are a simple “front and back” style of card. 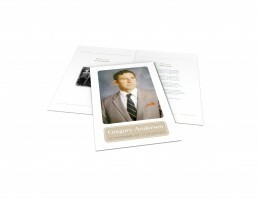 Typically, a photo is printed on the front of the card along with the name of the person and other details such as date of birth and date of passing. The back of the card is used to contain an appropriate verse. 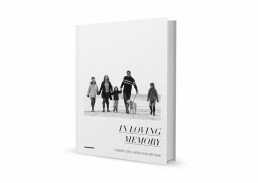 Our hard cover memorial books are a collection of your full colour photos presented. 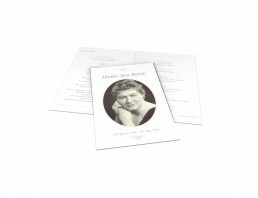 When considering your requirements for the order of service booklet, thank-you cards and other printed material, you can choose from our range of exclusive design options. Please note that the images and details depicted in the images on this page are for illustrative purposes only and do not relate to any real individuals. Forever timeless, the Noble range is a demonstration of style and sophistication. Designed for the older male, but equally suitable to reflect the style of a younger man, this range is a popular choice of our families. A masculine collection, the Virtue range expresses a modern take on traditional memorial stationery. The simplicity and silvery grey colour tones are refined and gentlemanly and are particularly suite to a discerning male. A simple design, the Ornate range is charming. The beautiful flourishes softens the design and the circular image spotlights the beauty of your loved one, combined with a soft blush finish the design is captivating. The Bespoke range is modern and fresh. Combining simplicity and pureness with chic elegance, the range has been designed to reflect femininity. This design is very simple and stylish. The Modern range has been created for the younger male or female, however the minimalism could suit any age. It brings a modern, chic and striking offer to our range.